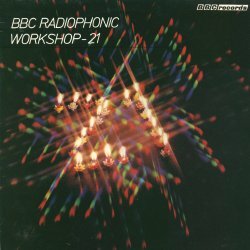 The Radiophonic Workshop in the early days was less often asked to provide pieces to stand on their own than to create atmosphere and sounds to be incorporated into complete productions. The work was undertaken on very primitive equipment and with a multifarious selection of sound sources including an old piano frame, a water cistern, an enormous selection of bottles -in fact, just about anything that would make an interesting noise! In those days there were no synthesisers or multi-track machines. Tape manipulation and editing were the main techniques employed and several layers of sound could only be created by recording each one on a different tape and playing them all together, all the while hoping that the tape machines would stay in synchronisation. Nevertheless, in spite of appalling problems the combined creativity of the people involved ensured that the Department not only survived but grew in size and reputation, each generation of composers building on the work of those who had left, and each adding their unique creative contribution. Side 1 (1-28) covers the period from 1958-1971. All the tracks are mono and as far as possible are copies of the original masters. We have resisted the temptation to clean up tracks, so they exist in their original form-tape hiss, crackles, warts and all-and the listener should be able to detect a quality change over the first side as equipment was gradually improved (starting about 1962) as high-quality tape recorders came into use at the Workshop. Side 2 (29-45) which is in stereo, is a cross-section of more recent material and shows how modern technology in the form of synthesisers and multi-track recorders has made a considerable difference both in the quality and the complexity of our work.